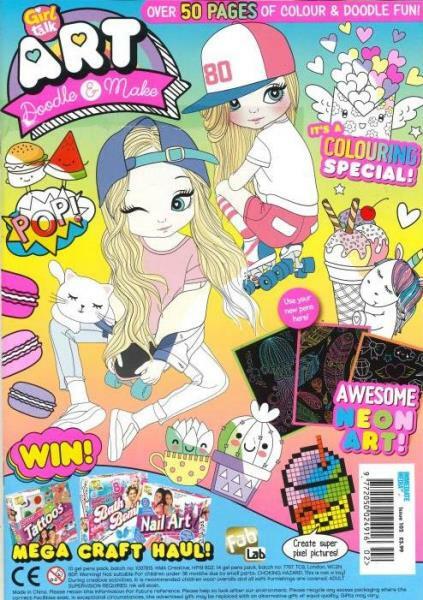 Girl Talk Art is a monthly magazine for art-loving girls aged 7 to 11 years old. A spin-off from the popular Girl Talk magazine, each issue is filled with creative activities from nail art design to bbf art projects.Buy a single copy or subscription to Girl Talk Art magazine. Girl Talk Art is educational and fun allowing readers to discover their creative side, find favourite hobbies and learn new skills. With each issue filled with lots to make and do including brilliant wall art, papercraft activities, home decorations, and doodle pages. Plus, find amazing competitions and fabulous free gifts! Our granddaughter is very pleased with the magazines....just what she was looking for. It's colourful, imaginative and educational too. My daughter cannot wait for the next issue to arrive, she loved it! It is a gift for a granddaughter, and she loves it and attemps many of tasks. She likes the excellent attachments. My niece simply can't wait for the next issue, which gets devoured! My daughter loves this magazine and looks forward to it every month. My daughter really enjoys receiving this magazine - she said at last an art magazine for her age! 11 year old grand daughter is very pleased. My daugther love this magazine as theres loads of things she can make without any help and lots of stuff she can do more than once. Fantastic mag for art loving girls. My 7 year old absolutely loves it and spends hours doing all the craft activities - great value!